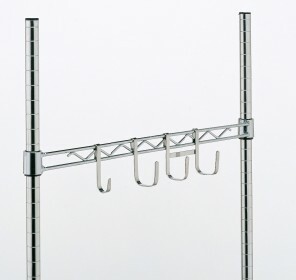 Metro Hooks are part of the family of Metro wire shelf accessories that compliment your shelving and carts. From casters, shelf ledges, shelf dividers to plastic split sleeves, hanger rails and handles. Additionally, Metro has the accessory to fit your need. Because multi-purpose hooks in three styles attach to hanger rails, mounting rails or shelves for instant access. Finally, with a single snap, shelving hooks firmly attach to existing wire shelving units and instantly provide extra sorting and storage space. They’re an ideal addition to any room of the house. Furthermore, in the kitchen, shelving hooks hold pots and pans as well as cooking utensils and mugs. They expand the storage capacity of attic and basement shelves by holding strings of holiday lights and hangers of seasonal clothing and extra bedding. Hooks in the garage protect extension cords, tools and sporting goods. They increase storage in bedroom closets for jackets, belts and scarves. In the bathroom, shelving hooks secure towels and robes. They hold keys, shopping bags and umbrellas in the entryway. Easy to install or move between rooms or to different shelves, shelving hooks customize almost any wire shelving unit. From multi-tiered closet shelving units in the bedroom to single shelves in the office, hooks increase storage capacity, improve functionality and provide versatility. They’re a storage and organizing essential in every room of the home. Finally, with a single snap, shelving hooks firmly attach to existing wire shelving units and instantly provide extra sorting and storage space. They're an ideal addition to any room of the house. Furthermore, in the kitchen, shelving hooks hold pots and pans as well as cooking utensils and mugs. They expand the storage capacity of attic and basement shelves by holding strings of holiday lights and hangers of seasonal clothing and extra bedding. Hooks in the garage protect extension cords, tools and sporting goods. They increase storage in bedroom closets for jackets, belts and scarves. In the bathroom, shelving hooks secure towels and robes. They hold keys, shopping bags and umbrellas in the entryway. Easy to install or move between rooms or to different shelves, shelving hooks customize almost any wire shelving unit. From multi-tiered closet shelving units in the bedroom to single shelves in the office, hooks increase storage capacity, improve functionality and provide versatility. They're a storage and organizing essential in every room of the home.